José Viñals (Madrid, 1954) is the Financial Counselor and Director of the Monetary and Capital Markets Department of the International Monetary Fund (IMF) and in December 2016 he will become the president of the English bank Standard Chartered. In 1982 he obtained his PhD at University of Harvard and two years later he started working in the Bank of Spain. 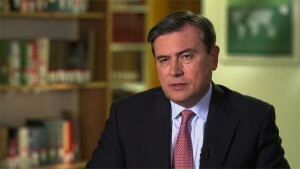 In 2006 he became the sub-governor of the Bank of Spain until 2009 when he entered in the IMF. During these years he also held positions in the European Central Bank International Relations Committee, the World Bank, Comisión Nacional del Mercado de Valores, etc. He also combined all these jobs with academic positions in CEMFI, University of Stanford, but in general his professional career has been closely tied to banks and monetary institutions. In 2001 he won the Rey Jaime I award thanks to his contributions to macroeconomic policy.